With the steady rate of development that has seen smartphones take the center stage of technology today, it will somehow surprise many people that we have to write on the best Garmin GPS Devices as our topic of discussion today. Many will feel like; this is the 21st century! I’ve got that on my phone. You’re right though, to an extent. 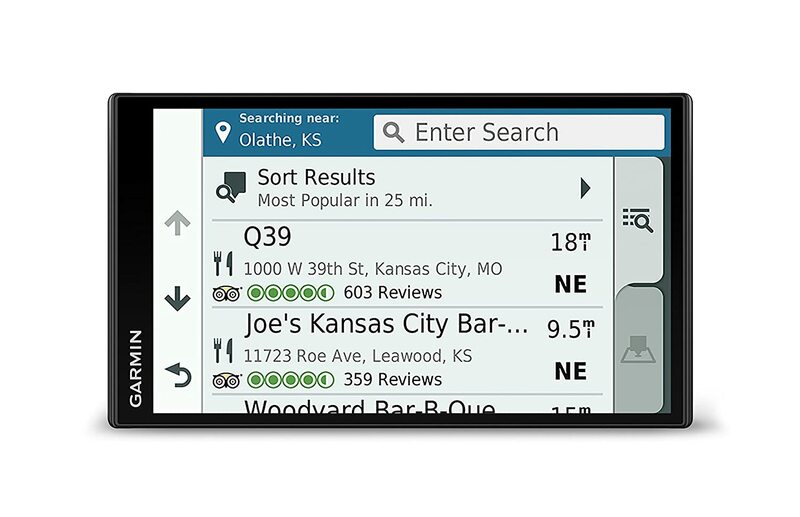 Smartphones today have some of the best cameras and GPS maps that we can find but still, nothing compares to a dedicated GPS device such as those from the manufacturing giant Garmin in helping you navigate through routes as you move around. Several manufacturers still produce dedicated GPS devices which are great for several reasons that include but not limited to running, hunting, driving, navigate airplanes, biking, harvesting fields as well as military operations. Names such as TomTom and Magellan ring a bell but Garmin is the leader in this industry. 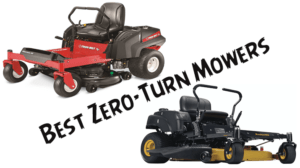 The manufacturer has produced some really great products which have gained them a stronghold in this market. Today, we’ll be looking at some of the best to come out of their ranks but before that, why would you really need a dedicated GPS device in this time and age? Why Would You Need a GPS Unit In the 21st Century? If you are the type that loves road trips so much, you’d agree with us that it may be annoying to be tethered to your phone over a long period of time. GPS devices like the best Garmin GPS devices will provide you with accurate and precise directions on routes and pointers to your intended destination. For drivers, aside from being free and relieved of having to hold on to your phone while still trying be driving sanely, dedicated GPS devices such some of those Garmin Car GPS will provide you all you need and more to get to your destination without having to rely on your cellular network. 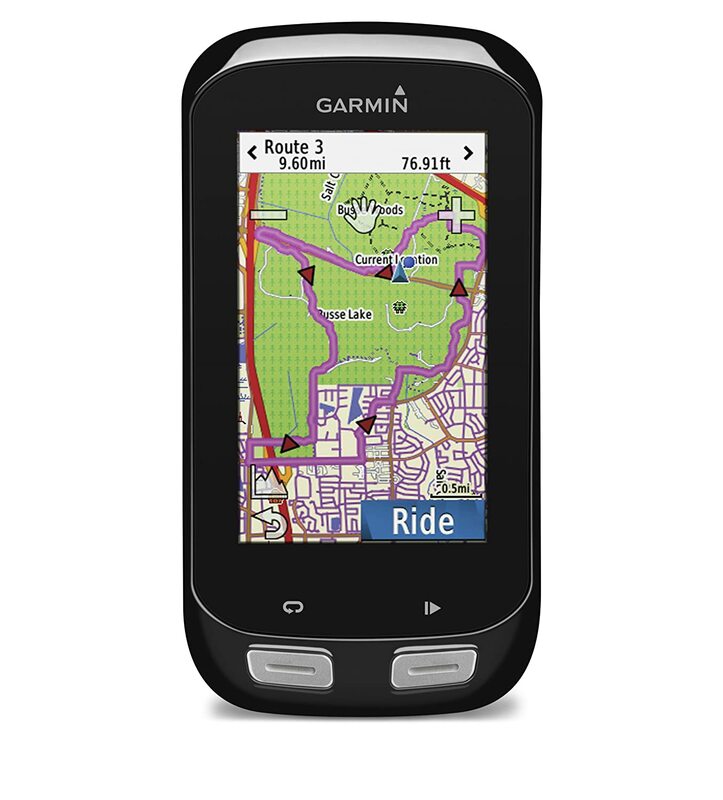 The modern-day GPS devices from Garmin will operate easily independent on your phone’s data plan or Wi-Fi. Along with these comes newer and more advanced driver assistance features. Other features such as Bluetooth connectivity, geo-based recommendations as well as voice commands are now done on larger HD displays. The truth today is that GPS units aren’t dead, many of these devices such as the best Garmin GPS devices would do most things your smartphones aren’t really capable of doing. 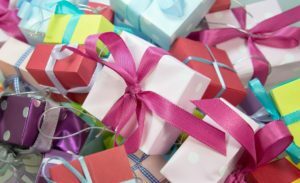 Truth is you’ll need to pay a little attention as it is with most other products or brands. Going shopping for Garmin GPS devices is one part of the equation already solved. Just like it is with buying other GPS devices, we’ll try to bring to you a comprehensive guide and tips regarding some of the most important features to look out for in the best GPS devices. These devices come in different sizes and so you should be sure of what you want. Large screens will make it easy to see the display but will also mean the size of the unit too will increase. Screen resolutions of most new GPS devices today also come in Full HD resolution or at least 720p HD. This will make it easy to see displays easily. Do you want a large screen size or a portable or lightweight device? This is yours to decide. Touchscreen devices are great and can be fun and easy to operate. Buttons for interface control are also great when you’d have to use your device with gloves on your hand most often. This though will depend on what you do and maybe the time of the year as people often wear gloves in the winter. So want to go touch or buttons? Decide. 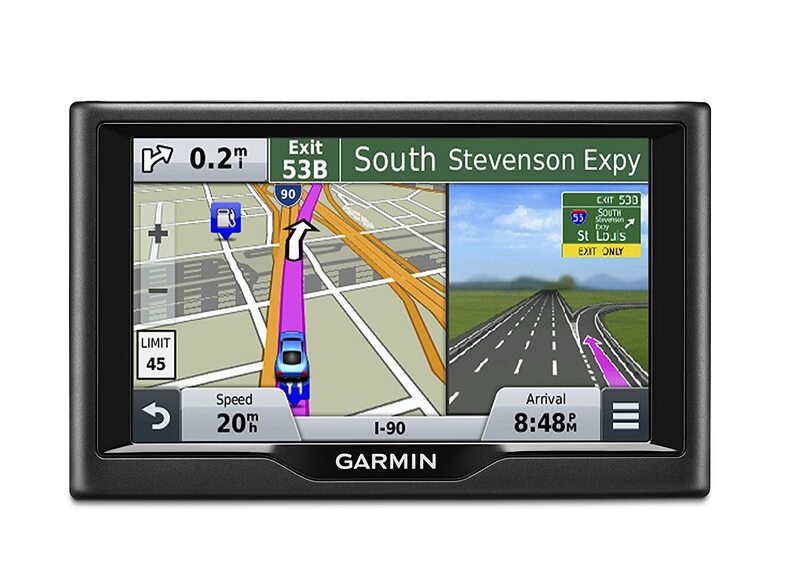 We’ve been asked several questions one of which is what the LMT in Garmin GPS stands for. The LMT means Lifetime Maps + Traffic. A good GPS device should be able to provide you traffic information and should also be able to take note of this while providing you real-time estimates of your arrival time to your destination. Having traffic information will help you avoid road closures, traffic jams if possible, and avoidable accidents. The purpose of GPS devices is to make navigations easier. When the use of this device becomes complex and confusing, the whole purpose has been defeated. While there are such GPS devices with complicated features and operation out there, the best Garmin GPS devices are some of the easiest to use in the industry. Technology and innovations have entered into the industry and now we have some GPS devices that will easily take vocal commands from users. While this will help you stay focused on driving to increase safety, it will also signal an increase in how much you may have to pay. Check out for this if you’d want it all the same in your device. Want more features such as 3D building view, updated maps, preload maps, third-party maps and software, wireless transmission and electronic compass? The list goes on and on. Although these will often mean you’d pay more for these premium features, they are great and can help ease the way you interact with and use the device. Pricing is one of those things you’ll also need to consider when trying to get your device. More features will often mean more dollars. Although our list still has some premium-priced Garmin GPS devices packed with premium-quality features and performance, there are still some of those bargain buys which also presents great value and performance despite retailing at an affordable price. Now, we are at the stage where we go more direct and precise with all we have been saying. It is no doubt that Garmin produces the best GPS devices as these have still been able to hold sway in a market that is always being threatened by the versatility of smartphones. We took to the streets as well as hours of online research to bring you ten of the best Garmin GPS devices available today for GPS navigation and other related purposes. 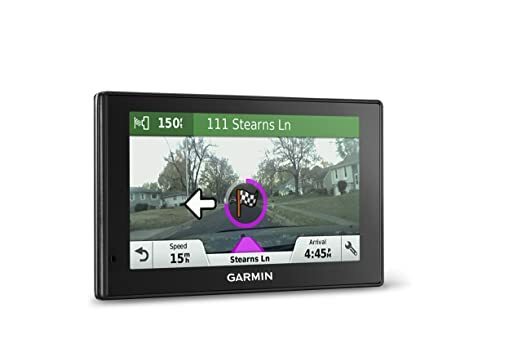 The 5-inch Garmin Drive 50LM GPS Navigation System is one of the most affordable models to come out of the ranks of the giant GPS manufacturer. It’s got some really powerful speakers and comes equipped with lifetime map updates. The ease of use is incredible and it surely deserves a spot should you consider fitting in a navigation system into your car which of course we duly recommend. The Garmin Drive 50LM sports a brilliant 5-inch touch display with a resolution that makes displays come alive. The screen also serves as your navigation panel as you make all your search and commands through the 5-inch display. The Garmin Drive 50LM is super easy to use. The GPS-dedicated navigator system has a dual orientation display which makes using the device a fun and superb experience. There is also the Driver alerts feature which is aimed at getting the driver aware at all times. It notifies drivers about upcoming turns and bends, school zones as well as speed changes in different locations. 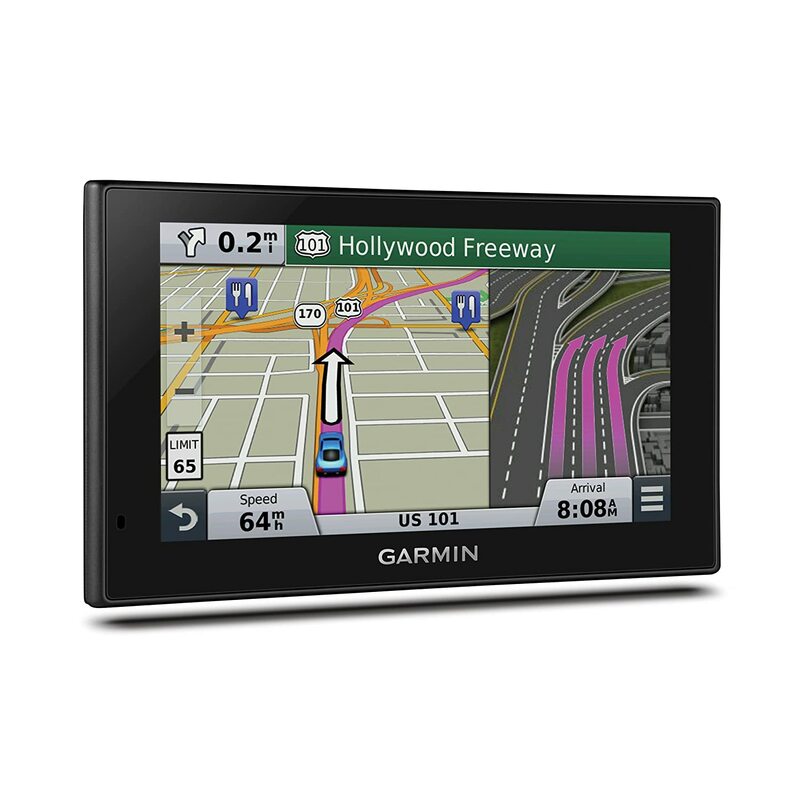 Another feature contributing to the superb ease of use of this GPS system is the Garmin Real Directions feature. The guide works just like a companion and guardian to guide you about directions as would a friend using important landmarks, traffic lights and more. Depending on the model you get, you’ll either get one with preloaded with a fully detailed map of the United States or one that has maps of the United States as well as Canada’s. it also feature preloaded Foursquare data as well as the peculiar Garmin Direct Access feature to make it easier to navigate your ways to either popular joints or complex-route destinations. When we set out to review only the best Garmin GPS devices, it was because we believed strongly in the quality and charisma of the Garmin brand of GPS devices. 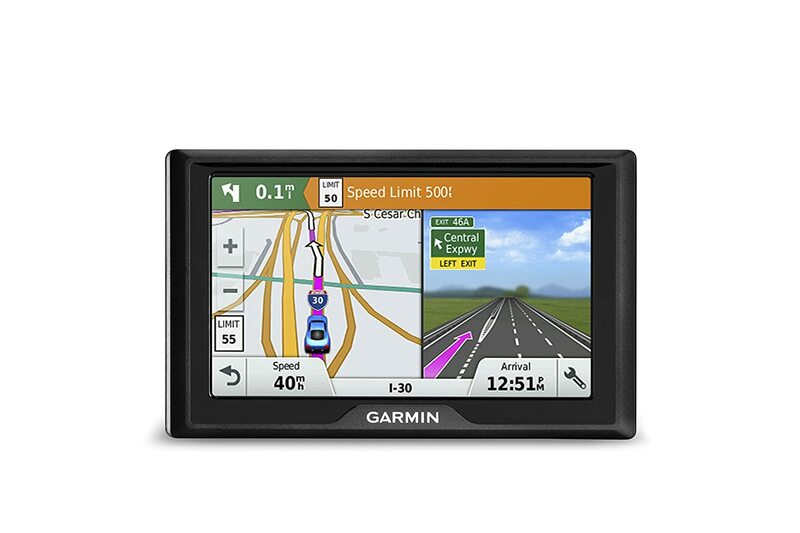 In the midst of excellent Garmin GPS devices, this Garmin Nüvi 2789LMT 7-Inch Portable GPS will always take a front seat. It comes with a large 7-inch screen along with a pinch-to-zoom display with dual orientation. The 7-inch glass screen is highly responsive and offers you a large screen on which it is easier to discern even the smallest details. The driving map is always displayed onscreen with traffic alerts displayed on the side. With the Up Ahead feature, you can easily find places ranging from gas stations, hotels and motels, restaurants and much more without leaving the map. There is also the voice-activated navigation feature which takes command from you directly through conversations leaving out the need to input addresses and more. 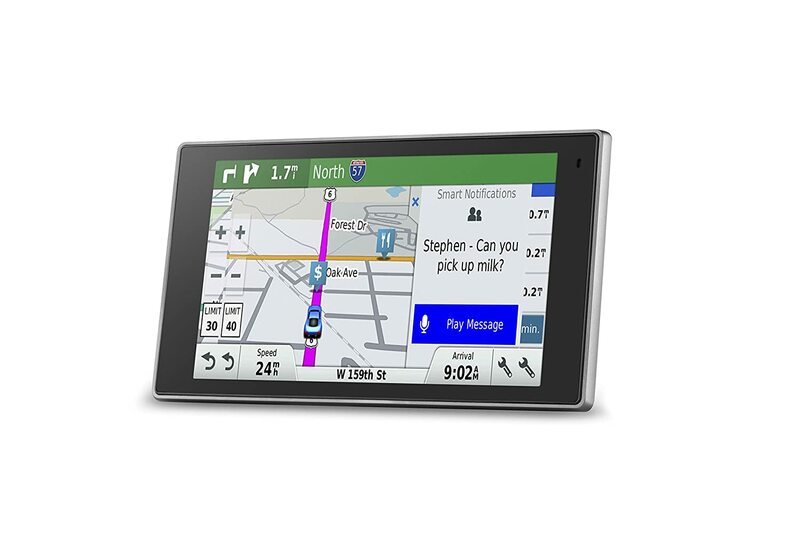 Along with Bluetooth connectivity, the Garmin nüvi 2789LMT 7-Inch Portable GPS also supports Smartphone Link that enables you to share info between your smartphone and the GPS device. This opens a wide door of new opportunities as you can enjoy more premium services such as weather radar and real-time traffic updates among others. The sleek and modern Garmin DriveLuxe 51 LMT-S is feature-laden offers great functionality. It comes with a full lifetime free updates for maps and software and comes packaged with millions of built-in points of interest along with a detailed preloaded map of North America. Just in case you’d want to download additional maps for other places and regions, it comes with a microSD card slot which allows you to expand the memory. The device is easy to use and the 5-inch color screen is made from a capacitive screen with greater responsiveness and clarity. The screen resolution on this GPS device is 800 x 480 pixels for easy readings and details. The Garmin DriveLuxe 51 LMT-S provides you with navigation information as you drive along. Information such as popular landmarks, upcoming turns or lane changes as well as the current speed limit is displayed on the screen for you to see. The Garmin DriveLuxe 51 LMT-S is one of the best Garmin GPS devices and with a simple voice prompt, you can get it to do tasks without having to leave the steering. For connectivity, you can pair your device to your smartphone via Bluetooth. This will provide you with information such as traffic alerts through the companion mobile app. 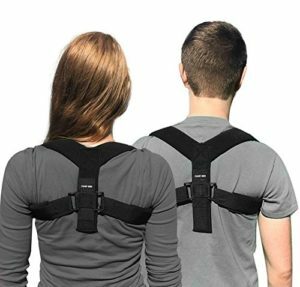 Thinking about how this device can be of assistance to you? It can help you find parking or even allow you to share your location with friends. The smartphone connectivity also gives you the benefits of receiving calls and messages in a hands-free mode without having to leave the wheel. The Garmin DriveLuxe 50 LMTHD is one very innovative GPS device and is easily the best Garmin GPS available as of today. The LMTHD in its name stands for ‘’Lifetime Maps and HD Traffic’’. This is simply implying that there are no complicated data plans needed as you’ll be getting lifetime map updates and traffic info for your device. The device comes with a 5.1-inch TFT capacitive touchscreen display with a resolution of 800 x 480 pixels. The 8-ounce device feels sturdy and solid and can be easily attached to the suction mount with its magnetic front part. There is a mini USB charger with which it needs to be plugged in. It also comes along with a microSD card slot on the bottom for expanding memory for map updates. Although it does not come included with a memory card, the Garmin DriveLuxe 50 LMTHD uses an internal solid state drive that is easily and quickly accessible to search for local hotspots and destinations. 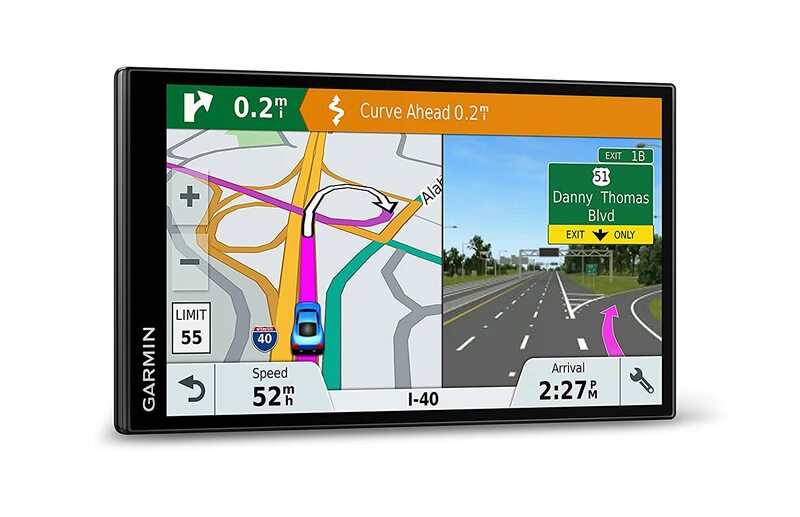 With the Garmin DriveLuxe 50 LMTHD, your days of using your precious data subscription for GPS navigation are long gone. The device is able to calculate the best route to your destination and can easily reroute if you’ve missed your way from the original point. Along with these many features comes with millions of POI, points of interest to locate the most popular joints and locations nearby. With a voice prompt, you can easily start using voice commands to search for addresses and destinations without leaving the steering. One other feature we seem to love about this Garmin DriveLuxe 50 LMTHD is the way it connects to smartphone devices providing an avenue for even greater capabilities. This can be done via Bluetooth as well as the Smart Link app for Android and iOS devices. This connectivity will allow you to use your phone in a hands-free mode to receive calls or texts. The Garmin DriveLuxe 50 LMTHD takes hands-free a little farther as it can also handle notifications such as new comments from social media apps like Facebook or Instagram. You know by now that Garmin sets the standards when it comes to making good GPS devices. This is once again evident in this Garmin DriveAssist 50LMT which for its many advanced features and innovative differences has made the list easily as one of the best Garmin GPS to come out of the ranks of this great manufacturer. The Garmin DriveAssist 50LMT is literally a dash cam with excellent GPS features along with optimum safety features for drivers and explorers alike. Want to upgrade your car with excellent new features such as forward collision and lane departure warnings? Think you can only get those in only those high-end luxury cars? Think again as we take you on a ride with this excellent and impressively-built Garmin DriveAssist 50LMT. On starting up, a large and vibrant 5-inch screen pops ups with the ‘View Maps’ and ‘Where to?’ menu. On top of the screen is the signal strength and the battery life as well as whether or not the camera is enabled. You can easily mount it using the suction mount as you go through the initial setup process which is equally easy. Numerous features and settings such as Forward Collision Warning, Garmin Real Vision, Forward Collision Sensitivity, Lane Departure Warning, Vehicle Height, Data Overlay, Video Resolution, Automatic Incident Detection and much more can be easily enabled. The Garmin DriveSmart 61 LMT-S is not just one of the best Garmin GPS devices. It is actually one of the best GPS devices available today. It is common to see modern day GPS devices get filled with all of those necessary and gimmicky features but this Garmin DriveSmart 61 LMT-S as with all of the other best Garmin GPS devices on our review only comes stocked with the best and innovative features. Despite this abundance of features in the device, there is still no complications and complexity as you can still easily navigate your ways through the interface for the navigator to direct your movement. It particularly excels as the easiest to use GPS device available today and it is no doubt one of the best Garmin GPS devices available today. First of all, the sleek and very modern exterior of the Garmin DriveSmart 61 LMT-S gives you an idea of what awaits you on the inside. A 6.9-inch capacitive touchscreen with HD resolution displays details with great clarity. The device also comes with a microSD card slot. The GPS device comes with preloaded maps of the US, Canada, and Mexico. Along with the device also comes a Lifetime free map updates. It also has a built-in Wi-Fi that can easily connect to your smartphone giving you the opportunity to make hands-free calls, as well as the ability to receive traffic, software and map updates. In case you forgot to plug in the charging plug, the battery will still take you about one hour. It is equally compatible for use with a backup camera. The device also comes with the preloaded maps of North America as previously said along with several millions of stored points of interest such as gas stations, hospitals, hotels, restaurants and more. You can also input your own favorite waypoints. The Garmin DriveSmart 61 LMT-S gives you notifications and alerts of upcoming turns, toll roads as well as changes in speed limits. Looking for a GPS device that is based on the routes and terrains of the North American region? Here is it. 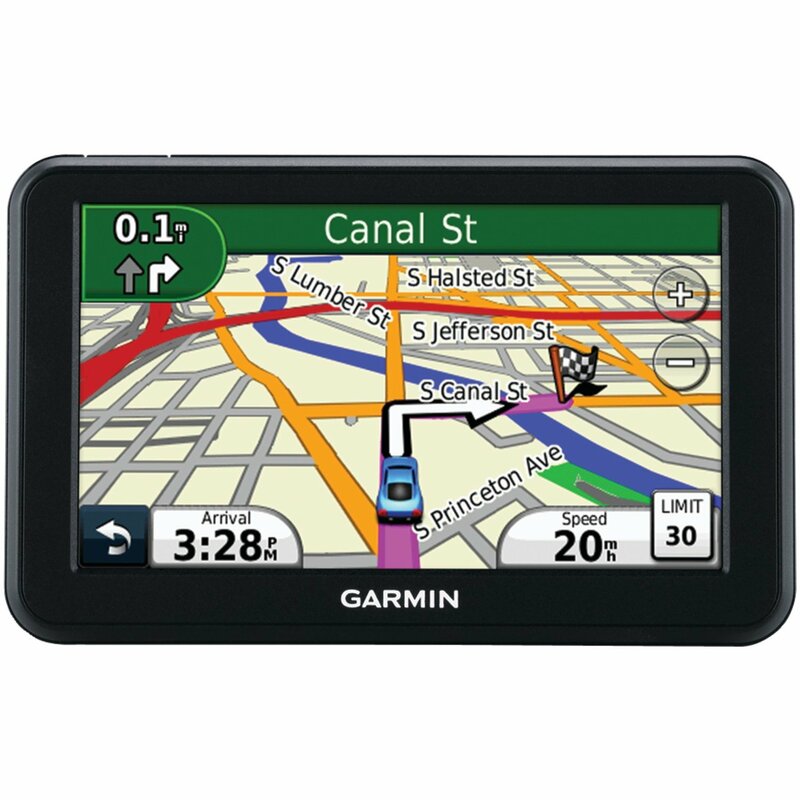 This Garmin Nuvi 2689LMT North America is fully dedicated to the North American routes and comes with a full and detailed map of anywhere you’d want to traverse all over North America. The device comes with a responsive 6-inch screen which provides you a great interface on which you can easily read and enter commands into the device. Just like some of the other premium Garmin GPS devices out there, the device has active lane guidance features as well as junction views. These features help you with more views to find the best lane and are aimed at helping you cultivate safe and good driving habits. Unlike your smartphone’s GPS features, this does not depend on your cellphone’s coverage to guide you around an advantage that is yet to be matched by the GPS apps on your smartphones. It also has the Up Ahead feature which provides you with distance and locations of the nearby points of interest. This may be restaurant, gas stations, ATM stations, etc. this is especially useful if you’re in a neighborhood where you’re not so familiar with. As an athlete or daring explorer, you’ll definitely need a smart watch for fitness tracking and a GPS system if you’ll be navigating unfamiliar routes. With such an excellent design and a bountiful collection of features, it’s hard to ignore the Garmin vívoactive HR GPS Smart Watch which will not only help you track your fitness but also function as a fully dedicated GPS navigation system. The Garmin vívoactive HR GPS Smart Watch is a smart watch designed and manufactured by Garmin. Trust anything with this name to have the best trends in GPS navigation and this Garmin smart watch did not disappoint. Although the design may seem a little chunky, the smart watch performs excellently and the colorful 1.38-inch display touchscreen provides users the means to interact with your device while also providing useful updates. The design is still eye-catching and it feels really comfortable on the wrist despite being a little chunky. The smart watch is compatible with both of Android and iOS and can easily monitor your sleep, heart rate along with a lot of other nifty features. The Garmin vívoactive HR GPS Smart Watch come with a fully dedicated GPS feature along with its host of other features aimed at enhancing physical fitness. The display is a 1.38-inch high definition display. It is colorful and provides useful update. Considering its status as a smart watch, the 1.38-inch screen is large enough for all your fitness and exploration adventures. The Garmin vívoactive HR GPS Smart Watch is water-resistant up to 50 meters and so should be a source of concern during wet runs and rainy days. The smart watch is compatible with any of iOS, Windows 10, or Android. It comes in two sizes for regular wrists and X-Large wrists. The watch is black but comes with interchangeable bands of Lava red, Force Yellow, and White colors. 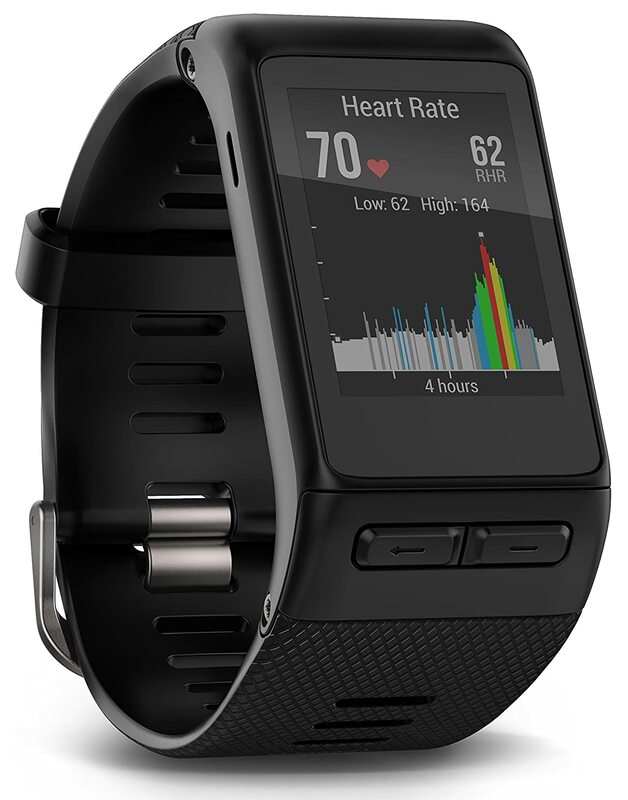 The Garmin vívoactive HR GPS Smart Watch can log and record activities ranging from running, biking, golf, swimming, walking, rowing, ski, indoor run, and walk indoor, among others. It can automatically track your sleep as it can monitor the heart rate. The smart watch is superb and will offer athletes and fitness enthusiasts some other cool features along with GPS features and functions. The Garmin Edge 1000 Bundle comes in again as one of the best GPS devices available in today’s market. The Garmin Edge 1000 Bundle is a GPS-enabled device that can be strapped to your bike to provide you the best of navigation and GPS services while cycling. You don’t have to worry about it getting lost, all you need to just do is explore! The device has a 3-inch color touchscreen with a clarity that makes it easy to read details on the screen. The display is specially designed to adjust to the light conditions of the surrounding areas and will automatically adjust in low-light areas such as in tunnels or shady spots. With the Garmin Edge 1000 Bundle, you can easily turn around your cycling sessions as it allows you to compete with the Garmin Connect Segment. The real-time results are displayed for you on the device as you’ll also get alerts for segment start and finish. Your days of limitation are now gone as you can explore just about anywhere when you are armed with this innovative Garmin Edge 1000 Bundle from Garmin. It’s no doubt Garmin is the leader when it concerns the best GPS brand. Just like we’ve seen in others, the Garmin Edge 1000 Bundle is another really innovative GPS device we’d recommend for cyclists and fitness enthusiasts. Most of our review products above are sleek and beautifully-designed touchscreen display Garmin GPS devices. For the sake of adventure and exploration, it is necessary that we discuss also some of the best handheld GPS devices along with these. Handheld GPS devices help with exploration of new terrains and landscape. These will ensure you remain on the right track and do not end up wandering around after missing your way. 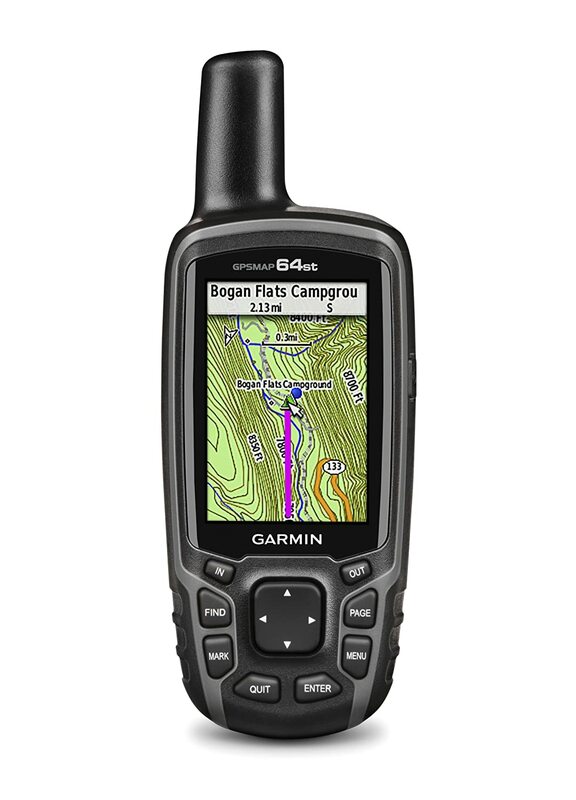 One of such devices is this Garmin GPSMAP 64st, TOPO U.S. 100K GPS. This is precisely one of the best Garmin handheld GPS devices and it’s got some really great features and a performance that you’d no doubt love to always take around. For display, the device has a 2.6-inch display that remains readable even under sunlight. The screen is colored and designed to provide you details and info that are easily readable without struggling or putting in too much effort. With the Garmin GPSMAP 64st, you can easily explore any terrain as the sturdy and strong navigator has a worldwide base map. There is also a full coverage of the US along with Alaska, Hawaii, and Puerto Rico. There is also a 3-axis electronic compass with accelerometer tilt compensation that helps to indicate where you are located and where you are headed. Coming with Bluetooth connectivity and ANT, you could wirelessly connect to your PC to share your waypoint and favorite routes with others. The device is capable of storing up to 5000 waypoints and 200 routes so you can easily store in your favorite trips and recall those later. 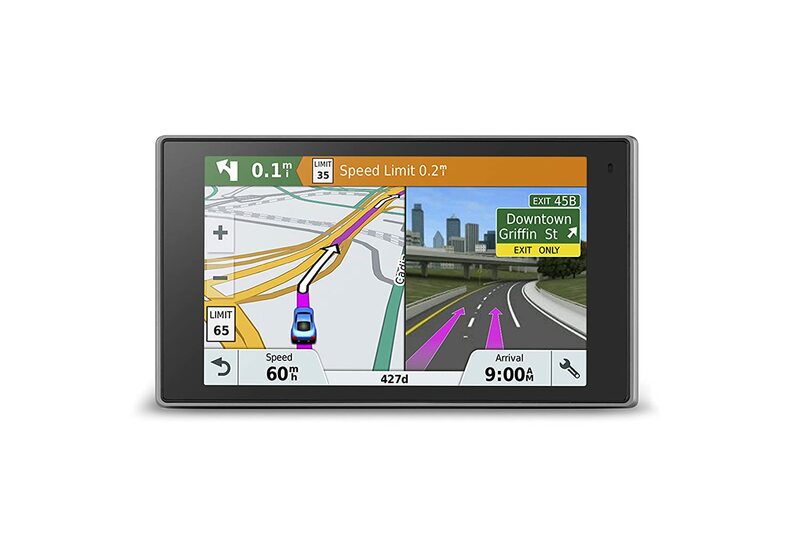 The Garmin Nuvi 3597LMTHD is a 5-inch GPS device from Garmin with top-of-the-line features and performances. It comes fully loaded with detailed maps of entire North America with lifetime updates and displays with great clarity on its high-resolution smartphone-like touchscreen display. The device has a lot to offer and is packaged in a beautiful and smartly-designed chassis which added good looks as icing on the cake to a very efficient GPS device. 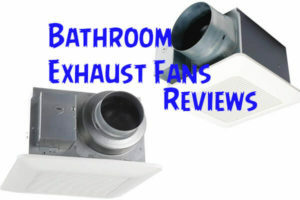 There are a lot of features that have contributed to this product making a place on our list. Although we won’t touch all of this as they are quite plenty, we’ll briefly discuss the basics as those are the most important areas we should be concerned with. The Garmin Nuvi 3597LMTHD has a 5.0-inch touchscreen display which we found out to be highly responsive. We are impressed as this is one of the best touchscreens you will find on most GPS devices nowadays. The 5-inch screen has a high resolution that displays readings with great clarity. Lifetime Traffic is the premium traffic service offered by Garmin. It is the HD Digital Traffic service and it alerts you when new updates as regards your route are received. The Nuvi 3597 has a special receiver which receives HD Traffic updates every 30 seconds. The Garmin Nuvi 3597 is Bluetooth-enabled and can be synced with your smartphone. One advantage of this is that you can use it as hands-free to receive calls using the device’s speaker. Smartphone Link app on the GPS device also allows you connect your smartphone to share information and data with each other. While we’ll not go into this in details, this feature is really awesome and will help the device send useful info and details to your smartphone. Other excellent features on this device are the voice-activated navigation which helps you easily speak to your device without having to type in addresses while smartphone link also offers more premium services such as weather radar and live traffic camera albeit at an additional cost. The device has over 10 million POIs and has 3-D buildings and terrains of the North America Landscape. Other features such as Garmin Real Directions offers a great user experience and the lithium-ion battery will last you about two hours if you forget to plug in the charging cable. With the many features as well as the availability and affordability of most GPS devices of nowadays, you’d hardly hear of people getting lost as GPS devices can easily help you discover where in the world you are and how you can get back home safely. Even though this product is no longer in production, the stock on sale is still receiving rave reviews and patronage due to simple things. We said simple things because rather than stock the device with mouth-watering features like it is in some of those premium-priced devices, the Garmin Nuvi 50LM Navigator only focuses on the basic while the design and build were also made to be as sturdy and durable as possible. You’ll have to wonder how this product made it into our list of the best Garmin GPS but the answers are simple. 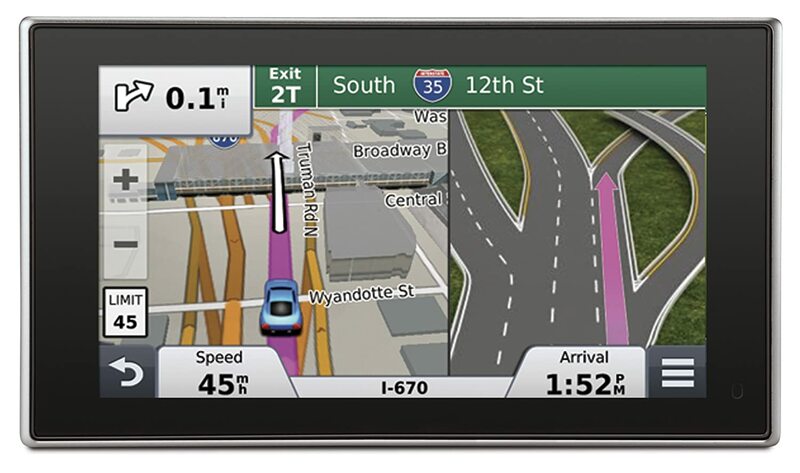 The Garmin Nuvi 50LM Navigator focuses on the basics without losing sight of the most important things. This meant that in the Garmin Nuvi 50LM Navigator, we have a capable navigator that will provide us with basic GPS navigation functions while still providing incredible value as it retails arguably as the cheapest Garmin GPs you can find around. The 5-inch touchscreen display gives you the best view and has been designed to make navigation easier. Whether you are a student, an athlete, military officer, car owner or more, this Garmin Nuvi 50LM Navigator is highly versatile and will fit into use in a wide range of areas. While the Garmin Nuvi 50LM Navigator will force you to make certain compromises, it is overall a great product if you consider the value and price point at which you can get it. Though it is not the usual top-of-the-line feature stacked device you’d have loved to see, the Garmin Nuvi 50LM Navigator offers great value and gives you far more than it asks in return. These are the best Garmin GPS devices available for explorers, car owners and cyclists as well as almost everyone. These offer the best navigation services in the industry. Choose from within these to begin to enjoy an easy and effortless guide and directions to your destinations without getting lost and hopelessly finding your way around. Garmin is the best GPS brand of manufacturers and with any of these ten Garmin devices, you can never lose your way again. It is based purely on innovations and expertise that GPS devices manufacturers such as Garmin have managed to stay around in a world dominated by smartphones. Garmin is one of the widely known manufacturers of these devices as they’ve earned a reputation and trust that is built on years of quality and innovative performances. When you need the very best from Garmin to help you with navigation especially with driving, cycling, running, exploration and much more, you can easily select from the top ten best Garmin GPS devices reviewed above as these promise you great fun. With the great clarity of details of the Garmin GPS devices, you can embark on your trip to anywhere in the world easily when you allow the best Garmin GPS to serve as your guide.